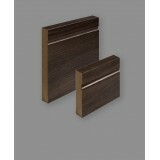 We have a great selection of Skirting boards available in many different finishes. 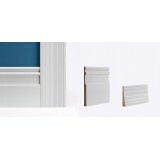 Oak skirting board, Walnut Skirting board, Primed white skirting board, red deal Skirting , shaker skirting, moulded skirting, Grey skirting and many more profile to choose from. 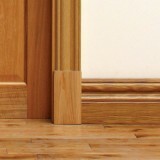 solid wood skirting. 4"skirting board, 5" skirting board 6" skirting board, 7"skirting board 8"skirting 9inch skirting. 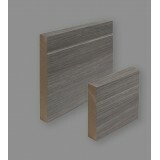 The Doras Daiken Grey skirting board comes in a durable wood effect Laminate shaker profile finish .. The Doras Daiken Walnut skirting board comes in a durable wood effect Laminate shaker profile f..
Deanta Oak MDF Half Splayed 6"Skirting 3.60mtr x 144mm x18mtr Lacqured finish. 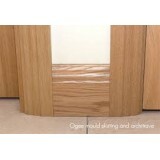 Real North Am..
Deanta Oak Moulded Skirting board 6"
Deanta Oak Moulded 6" Skirting Engineered. 3.60mtr x 144mm x 18mm American Oak Veneer on MDF. 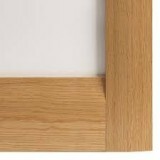 Pre..
Deanta Oak shaker skirting board is made from real north American white oak veneer. Crown cut venee..
Deanta Victoriana Oak Skirting 180mm in height and 18mm in thickness Size 180mm (7") x 18mm x 3.6..
Deanta Victoriana Primed MDF Skirting 5400 x180mm x 18mm per Length Primed MDF Solid ..
Deanta Walnut Shaker 6"Skirting Engineered. 3.66mtr x 147mm x 16mm American Walnut Veneer on..
Deanta Walnut Shaker 6"Skirting Engineered. 3.66mtr x 144mm x 18mm Real North American Walnut ven..
Deanta Wells Primed MDF Skirting 5400 x220mm x 18mm per Length Primed Wood Solid..